This year eight members from Belgium and the Netherlands attended the Brontë Society AGM weekend in Haworth, Yorkshire (the Society's main annual event) on 7-8 June. This account of a first visit to Haworth was written by Sherry Vosburgh, who joined our group just a few weeks ago and made a last-minute decision to go to the June weekend. 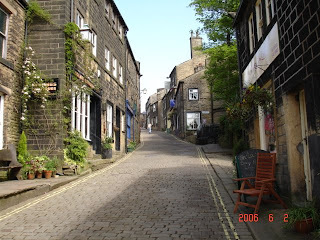 Most of the accommodation in the village had been booked months in advance but she managed to find a room, albeit right at the bottom of the steep hill up to the Brontë Museum and the venue for the events. However, she survived the experience and seems to have enjoyed it! Would any of you like to join us in Haworth for the 2009 AGM weekend (6-7 June)? Helen somehow talked me into it - leaving from Kings Cross for a Northern adventure for five glorious days. 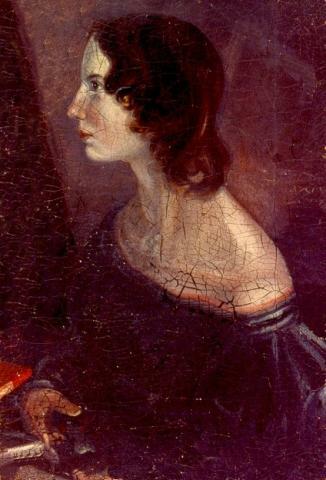 I felt a bit of a fraud as I had only read three of the Brontës' books, and wondered if I'd be accepted into the august circle of the Brontë Society en masse. I arrived without incident at my palatial B&B to a warm welcome. The "full monty" breakfast the next day stoked up the fires for my first visit to the Parsonage - waltzing in free as a fully paid-up member. I found the experience very moving, imagining the family living there and Emily dying on the sofa in the drawing room protesting that she was not ill... The exhibitions were fascinating - especially Charlotte's tiny dress and gloves for Emily's funeral... The letters and Gondal books were in minuscule fairy hand, impossible to read but transcribed for visitors. There was also an exhibition of fine modern photographs of the moors by Fay Godwin which put the house in context and made one realize how isolated Haworth was before the tea shoppes, pubs, curio shops and second-hand bookshops moved into Main Street. 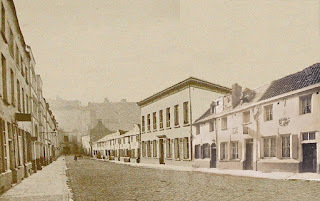 The climb up Main Street to the Parsonage had been described to me as steep, but I hadn't realized I'd need my heavy walking shoes every day for the cobbled street that never seemed to end. Between Brontë Society events it proved too time-consuming to go back down to the B&B and up again, so I ended up drinking endless pints of bitter and tea (complete with typical Yorkshire cakes and buns) and meeting others who were engaged in exactly the same activity. I met slightly eccentric people like myself all over the village, all very friendly and united in their common interest in the Brontë family - from as far afield as the United States chapter, the Netherlands and, of course, Belgium. The Brontë crowd had a certain look about them - urbane but rather wild-eyed - which made it easy to strike up conversations with complete strangers. The first event organized by the Society was a performance by a young professional theatre company called "Through the Window" of the earliest dramatic version of "Jane Eyre". The play had originally been performed at the theatre that became the Old Vic and had been adapted by Catherine McDonald from Patsy Stoneman's newly published edited version. Patsy was there to give an introduction and plans to come to Brussels this year. The play, skilfully filleted and using only a handful of actors, was very well received and was preceded by a cheese and wine party so that people could start getting to know each other. The next day brought a lecture on the originality of Wuthering Heights from Professor Heather J. Glen, from Cambridge University - fascinating - followed by a service in the local church to thank the family of James Roberts, who donated the Parsonage to the Society in 1928. 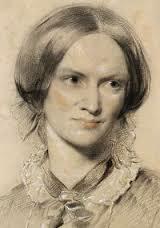 We all sang lustily and the church was full of Brontë Society and local people. The female rector's daughter sang the final Blessing beautifully. The AGM followed, at which plans were described for improving the modern exhibition space and to refloat the coffers. A few members seemed curious to know why there had been so many resignations from Council lately, but lips were sealed on their personal reasons for resigning. A dynamic-sounding Council was elected and the eloquent acting director of the museum shed light on its day-to-day running. The meeting had to close in time for the literary panel that followed (all events took place in the nearby Baptist Hall) in which the influence of Wuthering Heights was discussed by Toby Litt, Helen Dunmore, Sally Beauman and Stevie Davies, with Patsy Stoneman in the chair. All the writers spoke passionately about their admiration for Emily Brontë and produced a lively and fascinating discussion. The next day, Sunday, kicked off with two walks, one long and the other shorter. Feeling cowardly, I plumped for the shorter one, which turned out to be expertly led by Hedley Hickling, the outgoing Membership Secretary, who is a geologist and really knew his stuff. We wandered in a leisurely fashion over Penistone Hill and saw in the distance Top Withins, which may have been the model for Wuthering Heights. The views over the moors were breathtaking. In the afternoon a special treat awaited us - a performance of "The Well-Dressed Governess" by the History Wardrobe in a costume-in-context presentation of handmade replica and original costume items. The lady who presented the show has made all her own costumes and gave details of the kind of dresses considered suitable for governesses at the time (who had to blend into the background and favoured blue and grey) and told us how the undergarments were worn, demonstrating enough within the bounds of decency. On the last day there was a full-day excursion to the "Shirley" country, which I had to miss as it was fully booked. There were also two talks, one by Beryl Bainbridge on her novel- writing technique and what she owed to the Brontës and one in the old schoolroom, used by the Brontës to teach Sunday School, where a historical slide-show of Old Haworth was given by a local historian. I spent several happy hours browsing the two second-hand bookshops as well as the wide selection of old and new books on sale at the meeting venue over the weekend. I was most impressed with the wide selection of Brontëana at the Parsonage itself but had to limit my purchases to avoid carting them up hill and down dale throughout the day. That damned hill! I was introduced to lots of people, all charming, and by the end of the weekend I felt I was leaving a group of comrades and new friends. Doubtless we will all meet again next year at the next June AGM weekend. I can't wait for more of that lovely pub grub in good company, interspersed with cultural activities and wonderful views. A lovely break from Brussels. And much recommended.